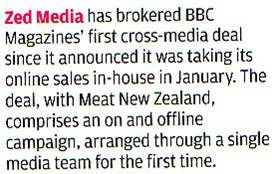 ZED has brokered an exclusive cross-media deal between BBC Magazines and Meat New Zealand. The on and off-line campaign is the first cross-platform display only deal that BBC Magazines has arranged through a single media team. This deal comes just weeks after BBC Magazines announced a new focus on aligning its media sales and made steps towards moving its online sales in-house. ZED’s unique multi-channel media expertise makes the agency ideally positioned to link cross-media negotiation through a single team and gain extra value for clients as a result. The aim of the BBC Magazines campaign is to raise awareness of New Zealand Lamb amongst the target upmarket female audience. Commencing early March, the three month campaign includes print activity in the BBC’s Good Food magazine, olive and Easy Cook with accompanying online placements on BBCGoodfood.com homepage and recipe pages.